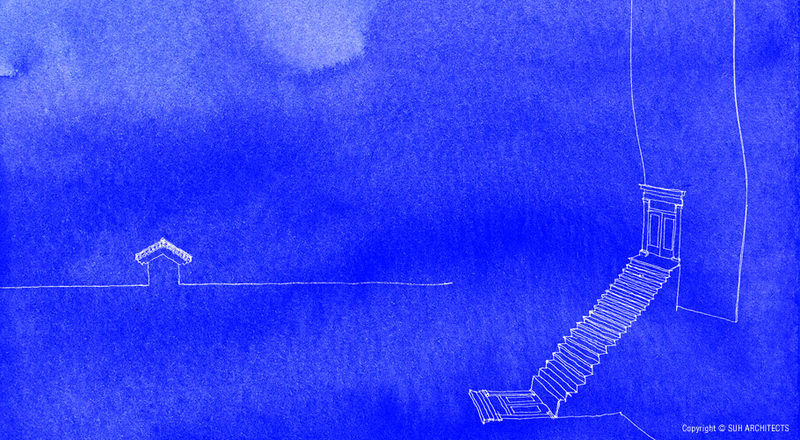 ‘Blueprint’ is a dialogue between an artist’s home, twice-removed, and its past, present, and future silhouette. This dialogue began with two brothers, Do Ho and Eulho Suh (SuhArchitects), exploring their notions of home. 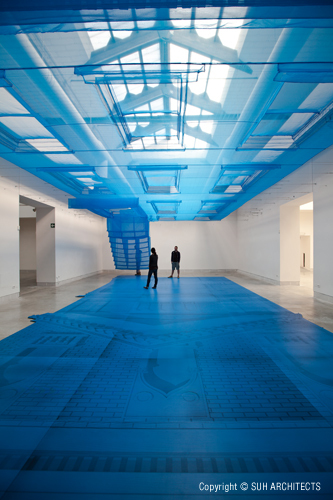 Beginning with artist Do Ho Suh’s current New York address, the collaboration with SuhArchitects re-envisions the Hanok in which they grew up together as it arrives in Venice, Italy. 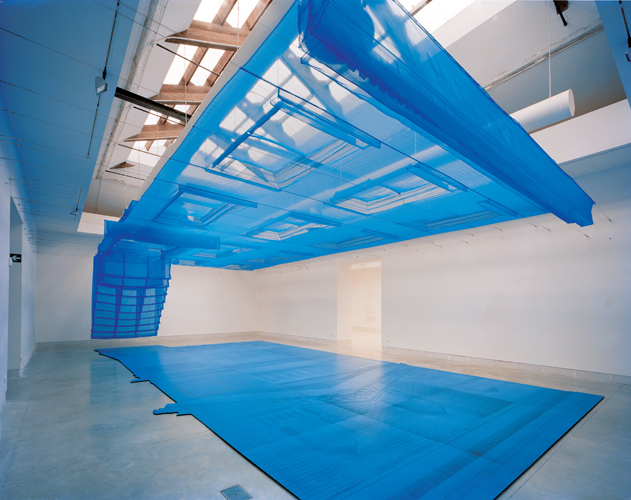 Do Ho Suh’s work is a full-scale (1:1 scale) 12.7 meter tall, hand-stitched, translucent fabric façade of the New York townhouse where he presently resides. As part of a series of works recreating the buildings in which he has lived, the artist continues to explore the notion of home in a nomadic, global society. If suspended vertically, the viewer is invited to enter this dream-like drapery building through an entry on the ground floor. Beyond the entry, the viewer then finds himself standing on what appears to be the building’s shadow. If suspended horizontally, the townhouse hovers above the viewer, an ephemeral blueprint floating in from New York. From this cobalt blue ‘ceiling,’ a front stair extends down to the floor where SuhArchitects’ ‘reflection’ begins. This full-scale floor installation is comprised of CNC routed High Pressure Laminate panels upon which viewers are able to walk. 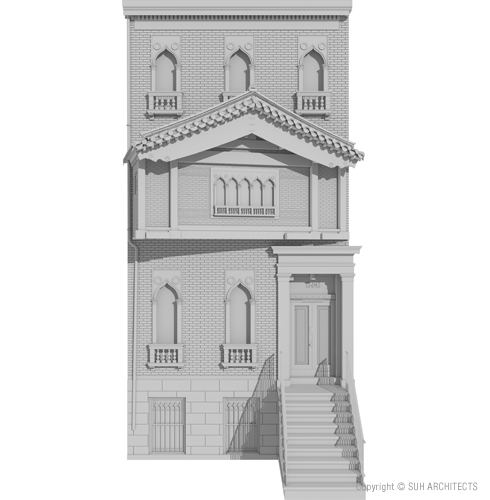 The image is a compilation of a section of the artist’s original Korean home, his present New York home’s façade, and a typical Venetian villa’s façade. These three building facades do not merely overlap; they adopt characteristics of one another to emerge as a new composite shadow that reflects three different homes at once. Thus, by creating a hard, physical imagined ‘shadow’ that is a reflection of a soft, ephemeral architectural façade, this collaboration questions the boundary between ‘real’ and reflection, between art and architecture, between where one once was, now is, and soon will be. 설치작가 서도호와 서아키텍스(서을호+김경은)가 제 12회 베니스 비엔날레 국제건축전 본전시에 초대되어 그들의 공동작업인 ‘청사진 Blueprint’을 전시하게 되었습니다. 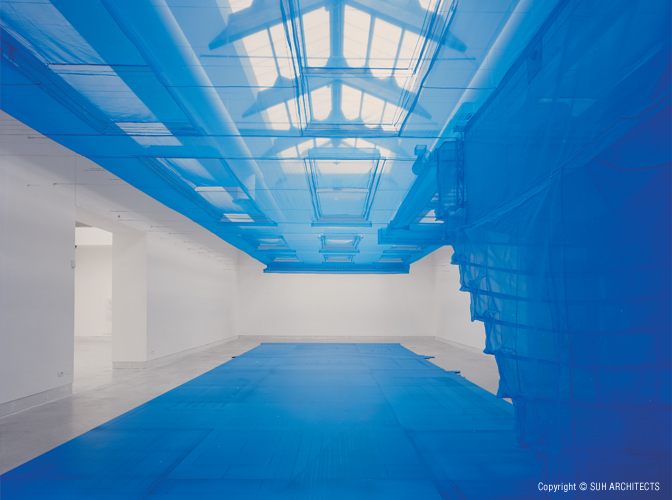 비엔날레 총감독인 세지마 카즈요가 기획한 본전시 “People meet in architecture”에 전시되는 ‘청사진 Blueprint’은 Palazzo delle Esposizioni della Biennale(이태리관)에 설치, 전시될 예정입니다. ‘청사진 Blueprint’은 두 세대를 걸쳐 살아온 작가의 집과, 그것의 과거, 현재, 미래 사이의 대화입니다. 서도호, 서을호(서아키텍스) 형제가 생각하는 ‘집‘의 의미에 대한 생각들로부터 시작된 이 대화는 서도호의 뉴욕 자택에서 출발하여, 서도호, 서을호 형제가 어린 시절을 보낸 ‘한옥‘을 거쳐 베니스에 도착합니다. 서도호의 작품은 코발트색의 얇은 천을 바느질해 높이 12.7미터의 뉴욕 타운하우스 전면을 1:1 스케일로 재현한 것입니다. 자신이 살았던 건물들을 천으로 만들어 다른 장소에 옮겨 설치하는 작업을 통하여 작가는 정주하지 않는 세계화 사회에서 집의 의미를 묻고 있습니다. 작품이 수직으로 세워져 있다면, 관객은 작품속 건물 일층의 입구를 통하여 몽환적인 장막 안으로 들어오도록 안내될 것입니다. 그리고 입구를 통과한 관객은 건물의 그림자 위에 서있는 자신을 발견할 것입니다. 하지만 작품이 수평으로 뉘어져 있기 때문에 뉴욕에서부터 건너온 건물은 관객 위에 머무르게 되면서 더이상 건물의 전면이 아닌, 전시장의 천장이 됩니다. 짙은 코발트색의 ‘천장‘에서 입구계단이 내려옵니다. 바닥과 계단이 만나는 곳에서 서아키텍스의 ‘그림자 reflection’가 시작합니다. 실물 크기의 바닥 설치물은 관객이 그 위를 걸을 수 있도록 고밀도 목재 패널로 제작되었습니다. 여기에는 작가가 살았던 한옥, 현재 살고 있는 뉴욕의 집, 전형적인 베네치아 빌라의 정면이 CNC 조각기로 파인 홈으로 겹쳐져 표현되었습니다. 이들은 단순히 포개져 있는 것이 아니라, 서로 다른 세 집이 각각의 특성에 조응하면서 하나의 그림자로 맺히게 됩니다. 부드럽고 한시적인 건물 전면이 단단하게 형상화된 ‘그림자 reflection’로 투영되는 작업을 통하여, 서도호와 서아키텍스의 ‘청사진 Blueprint’은 현실과 반영의 사이,예술과 건축의 사이,한때 있었고 지금 있으며 앞으로 있을 곳,사이의 경계에 대한 끝없는 질문을 던집니다. 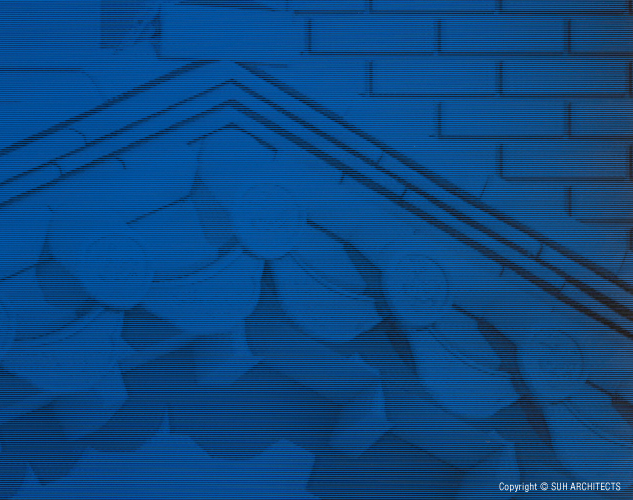 People are watching the ‘Blueprint’. Arthur Henoch, Dirent Dimensions Inc.